tesouros-em-pergaminho-evento-93 Fol. 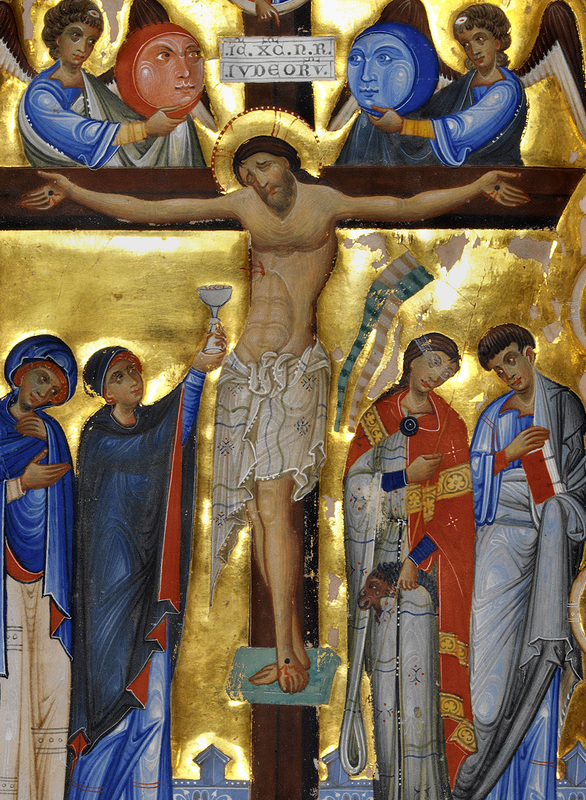 118v: Crucifixion with four standing figures: on the left the Virgin and Ecclesia, on the right Synagogue and St John the Evangelist; above, discs representing the Sun and Moon, each supported by an angel; the border is punctuated by the symbols of the evangelists, prophets and patriarchs (detail). The LA222, known as the Gradual of Admont, is a complex codex produced in the latter part of the thirteenth century for the Austrian Benedictine monastery that gives it its name, probably by a follower of the Paduan master Giovanni Gaibana. The first part contains the gradual, followed by the sacramentary which opens with the Canon of the Mass. This work’s many points of interest, including the notable musical notation of the gradual, display an extraordinary splendour in terms of the ornamental and iconographic abundance and richness, as well as in the technical skill of the Venetian-Paduan school. Of particular significance is the set of miniatures that opens the sacramentary, demonstrating the oldest decorative traditions of the Canon, and to which we shall give special attention.